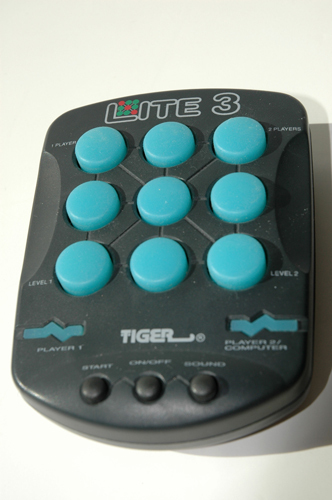 The game of Lite 3 was created by Tiger Games. Each player is assigned a red or green piece. To move: Select an open slot. To win: Be the first player to get three of your pieces in a row either horizontally, vertically or diagonally. 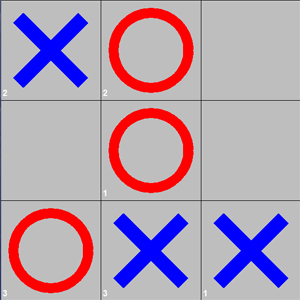 Lite 3 is a game very similar to Tic Tac Toe. The game is for two players. 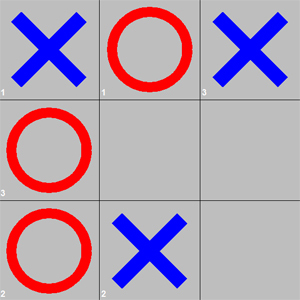 The only rule added to this game is that when a player has four of the squares selected on the board, the first square that the player selected becomes neutral again. Memory: Try to remember the order of the pieces placed because a button may shut off even if you think you have a winning move. Misere: Force your opponent to connect three of his pieces in a row either horizontally, vertically or diagonally. Novice/Expert: The actual game supports a novice/expert mode. In the novice mode, there is no time limit. In the expert mode, the computer plays at its smartest and there is a time limit.